Thursday August 9 would have been my father’s 91st birthday. It’s also Book Lover’s Day. Those two seemingly incongruent circumstances actually have a powerful connection for me. After suffering a major stroke on February 10, 2012, my father passed away on February 25. By the time I was able to get back to Tennessee to see him, he had lost motor functions and speech capacity. Over the few days I was there, the slow but steady decline continued. I had last seen him during the Christmas holidays. While there, I spent some time alone at home with him. After suffering a series of strokes over the past several years, he could no longer read – but the legacy of his reading lines the bookshelves all over my boyhood home. In the quiet hours when everyone was asleep, I scanned the shelves and remembered hearing him talk about this book or that one. I pulled a few off the shelf, and opening them, was instantly transported back in time to a conversation about the subject, or to memories of the event itself. I’ve been a reader of books since, well, before I can remember. My father was an avid reader, and he passed that passion along to me at an early age. Even though he worked 6 days a week, 12 hours a day, he often spent several hours reading at night. He insisted my mother take my brother and me to the library in the next town and check out books – every two weeks. I would get the maximum number of books, take them home, and read them – usually in the first day or two. Then it would be an impatient wait till the next library trip. Reading is a passion I treasure, and one that I am thankful my father instilled in me. Tomorrow it will be Book Lover’s Day – not an official holiday but one I eagerly celebrate. Book reading is a great hobby. It’s an important one, too. Employers look for it on resumes. Reading is educational, informative, and relaxing. It makes us both smarter and happier people. Book Lovers Day is a great day to celebrate. Just grab an interesting book, find a quiet, cozy place, and crack open the cover. Celebrating Book Lovers Day in August is pleasurable on the deck, under a shady tree, poolside, or in a cozy hammock. If you fall asleep while reading, that’s okay. It’s all part of the relaxing benefits of being a book lover. I’m also celebrating this Book Lover’s Day as a part of my vocation – Vision Room Curator and Digital Engagement Leader at Auxano. My role requires me to read – a lot – and then write book summaries, Tweets, Facebook posts, and blogs about what I’m reading. During a recent consultation with a client, I was able to pull a half-dozen book titles off the top of my head when asked for recommendations on books about Guest Experiences. That’s part of the benefit of reading! With a two-week production cycle, and a two-week preparation phase, at any given time I’m working on 4 SUMS Remix issues, which means there are 12 books on my front burner. Then there’s current reading for Auxano social media (Tweets and Facebook posts), preparation for Guest Experience training and consultations, other writing projects, and believe it or not, reading just for the pleasure of reading. If you want to know more about my dad, here is the eulogy I gave at his funeral. After the funeral, while my sons and I were moving some things around his gas station, I discovered one reason I am so passionate about guest services. And read this post to find out why readers are leaders. How are you celebrating Book Lover’s Day? Some of the most flavorful, satisfying, and versatile sauces in the culinary world are an emulsion – but you’ve got to work to make one. 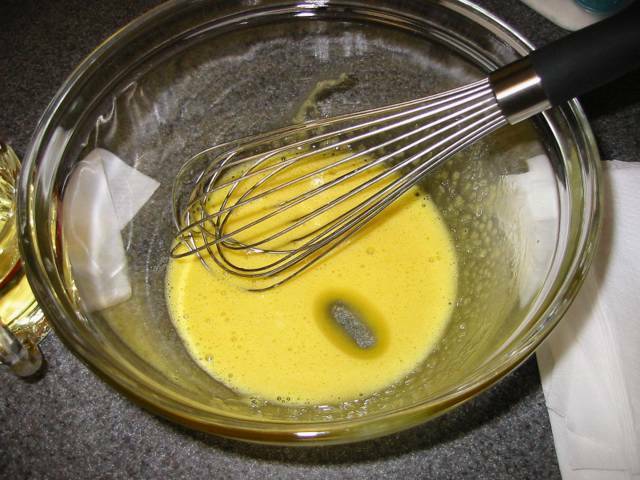 This is an emulsion: an agreement between two unlike elements (butter and water), achieved by heat and motion. If you get it slightly wrong – as when the sauce starts to dry out, destroying the balance between the fat and the liquid – the unlike elements pull apart and break up. When that happens, it takes more work to get the emulsion back to where you want it than it did to get it in the first place. As a ChurchWorld leader, you are, in effect, an emulsion. Both leadership and management are necessary skills to bring your organization forward. While many people separate “leadership” and “management,” they are both necessary. Leadership involves inspiring, motivating, crafting a vision, setting direction, strategic thinking, and bringing out the best in your people. Management involves planning, tracking, and measuring – in short, handling all the nuts-and-bolts of day-to-day business operations. People in positions of responsibility and leadership – like you – need to do both well in order to be successful. This need dramatically intensifies during times of economic uncertainty, shifting internal and external forces, and the constant need to do more with less – like now. You need to be an “emulsified leader:” building solid skills in both leadership and management AND the ability to switch gracefully between the two. The skills of an emulsified leader are certainly called for when Guest Experiences are concerned. Continuing a 3-part series begun here, here are three more “secret sauces” from Chip Bell’s book Sprinkles. Ambiance can be defined as “the character and atmosphere of a place.” As humans, we are wired to favor symmetry. Our psyche reads dissonance in an experience long before our logical mind comprehends the reason. When you weave all five senses (sight, sound, smell, touch, and taste) together, you can create an experience that yields a story your Guests are eager to spread. The secret sauce of Ambiance involves integrating all the sensory elements of a Guest Experience so they are congruent around a compelling story, theme, or vision. The secret is attention to minute details because the Guest’s brain can pick up any dissonant signal or symbol. What opportunities would you discover if you looked at your organization’s environment and experience with all five senses in mind? Adoration can be defined as “deep love and respect.” There is no greater gift one can give a Guest than serving them with love. Love is also expressed in how your team members love the organization they represent. The secret sauce of Adoration comes from ensuring that your front line team members know your organization’s benefits, not just the feature. It comes from investing in your team’s training. What can you do to make your Guests fall in love with the team member and the experience they are receiving? Allegiance can be defined as “loyalty of an individual to a commitment or cause.” It is created through the small acts of communication and caring that make Guests feel they can trust your team members to serve them well. The secret sauce of Allegiance is demonstrated when your team members treat Guests like valued neighbors rather than strangers. It grows as a trusting relationship is developed, with a focus on the Guest, not the task at hand. How will your organization deliver an unexpected surprise to Guests, seeking to build trust with them in every encounter? In the past three weeks, I have had two medical procedures where I encountered first hand, an amazing Patient Experience. In the past, I have written about the Patient Experience from an outsider’s perspective, but this time, it was up close and personal. If you like details, read on. If you want the bottom line, go to the bottom of this post. During my annual physical earlier this year, my long-time personal physician, Dr. Michael Sherrill, reminded me that, as someone above the age 50, I really needed to schedule a colonoscopy. After 7 years of reminders, I gave in and scheduled it for the last week of May. About the same time, an umbilical hernia that had developed several years earlier became larger – and painful. Once again, my PCP said it was time to correct that, as it would only get larger and more painful. Following a quick referral to a surgeon, I scheduled the surgery for June 12. My initial consult with the doctor performing the procedure was very informative and thorough. More importantly, I felt genuine care and concern from my doctor, not just part of the day’s schedule to be rushed through. After leaving the doctor, I went to the scheduler, who also was very thorough in explaining the preparation I would need to go through, the options for the meds needed, and a personal connection to someone in the office should I have any questions in the meantime. Four days prior to the procedure, I received a call from the office, asking if I had any questions about the procedure, the preparation for it, and the diet adjustments. Having had a sigmoidoscopy 30 years ago, I recalled the preparation to be unpleasant, consuming over a gallon of foul-tasting liquid to cleanse the colon. It worked, but the taste of strawberry medicine to this day gags me. This time around, two sixteen glasses of a water/solution mix, followed by a glass of water was much more pleasant. On the day of the procedure, I checked in with a very pleasant receptionist, who had everything ready to go, pointed out a comfortable waiting room for my wife, and ushered me back to the prep nurse, who led me through the final forms (digitally signed and stored). I was then escorted to my prep room, where the prep nurse went over briefly what would occur over the next few hours, and laid out a packet pulled from a metal cabinet. The packet contained my robe and a blanket. What I didn’t know until I put the robe on was the fact that it was a heated robe, which felt really comfortable in a chilly room! Next, I was introduced to the nurse anesthetist, who explained what her part of the procedure was, and helped the nurse get me ready with an IV. With that in place, I was wheeled into the procedure room. There I met my doctor, who introduced me to the tech who would be assisting her, and asked if I had any questions. Having none, I was asked to scoot a little over to one side, and after that I remembered nothing till I woke up in a recovery room. The nurses checked on me as soon as I was awake, bringing some juice and water to drink. Shortly after that, the doctor came in with a preliminary report – all good, with one biopsy report to follow. My wife (whom the doctor had already visited with) was ushered in to sit with me for a little while to make sure I was steady enough to dress. While we were both there, the nurse came by with discharge information, and again, a personal connection should I have any questions over the next few days. Another nurse brought a wheel chair in, helped me into it, and wheeled me out to our car. The next day, I received a call from the office, asking if everything was going okay, and a reminder to call immediately if I had any concerns. My routine colonoscopy at Charlotte Gastroenterology & Hepatology was flawless throughout the whole process. Dr. Cullen and the whole team assisting her – Tawni, Deb, Brenda, Monica, and Joy – provided first class, personal care throughout the whole process – from beginning to end (pun intended). Just two weeks later, I was preparing for my first surgical experience. Unlike the initial steps of the colonoscopy, this went very quickly. Two days after the visit to my personal physician and his referral, I received a call from the surgeon’s office to schedule the initial consult with the surgeon – which was set up for the following week. At the initial consultation, the receptionist gave me the traditional form set with a twist – they were set up with a special pen and paper so they would be transferred digitally and available for me, my PCP, and the surgeon as needed. A nurse called me back, took the preliminary information needed, and said the surgeon would be in shortly. Within 10 minutes, the surgeon walked in, introduced himself, reviewed my complete medical history (sent over by my PCP), and asked if there were any changes. When I informed him about the upcoming colonoscopy, he suggested that we schedule the hernia surgery following the colonoscopy, as there was a small chance that the gas used to inflate the colon could damage the hernia repair incision. If that had not been the case, I would have been able to have the surgery the next week – less than two weeks after the initial consult. Warning me that the exam would be a little painful (after all, I had a tear in my abdominal muscle) the surgeon proceeded to determine what was needed. After the exam, his initial recommendation was laparoscopic surgery to repair a golf-ball sized tear. He also told me while this was a routine operation for him (he has done over 200), he assured me that he and his team would treat it with the utmost care possible. After answering a couple of questions, he escorted me to the scheduler’s office to set it up. Thanking me for coming to him, and saying he would send a note to my PCP, he said he would see me in a few weeks. The scheduler was very pleasant and efficient to work with – she was obviously very familiar with the process. Noting that it would be several weeks out, she recommended a Friday time slot because it allowed for the least disruption to my schedule. With that all set up, she walked me to back to the front office. During the time I had been in the exam, the office staff had printed all the forms, contacted and verified my insurance, along with an estimate of my out-of-pocket costs. Answering one question, she gave me all the information and I was on my way out in, the total visit less than one hour. One week before the surgery, the hospital called to verify my information and get any changes in my condition since the visit to the surgeon. The caller was very friendly and had a sense a humor – when asked if I had any recent weight loss, I asked if the colonoscopy prep counted, she laughed and said I didn’t have to tell her anymore. At the conclusion of the call, she informed where to park, which door to enter, and wished me well. Two days prior to the surgery, the surgeon’s office called with a reminder of the date and time, as well as the night-before preparation. Again, the caller was very cordial, seemed in no hurry and wished me well. On the day of the surgery, my wife and I drove to the hospital, where the parking was as noted, and convenient to the entrance. There was an option for Valet Parking, but I didn’t want to do that. The receptionist greeted us with a smile, asked for my name, and escorted me back to the surgery area. There my information was verified, my wife was given a code to follow the surgery process on a screen on the wall, asked if she needed anything, and then we went back to the prep area. In a small but comfortable room, a nurse met us, reviewed my information, and gave me a kit which included a bag for my clothes, a robe, socks, and a heated blanket. Once I changed out, she returned to place the IV for the antibiotics and anesthesia. A surgical nurse came by to review my information and the procedure, asking if I had any questions. While talking with her, the anesthesiologist came by – possibly the funniest medical conversation I have ever had. While talking with me, the other anesthesiologist stuck his head in the door and was cracking jokes with the nurses, me, and his partner about an ongoing completion they were having. My surgeon was next, stopping by to update me on the morning’s schedule, reviewed the procedure, and asked if I had any questions. He told my wife he would be out to talk with her as soon as the surgery was over. After about an hour’s comfortable wait, a flurry of activity began with the preliminary anesthesia, leg circulation pads, and a final review of my vitals. Telling my wife goodbye, I was wheeled to the surgical suite. The nurse transporting me joked about her speed and being in NASCAR country, said she would try to keep me out of the wall. In the operating room, I was asked a final time about my information, and saw a mask coming down over my face. The next thing I remember I was in the recovery room. Evidently I had spent about an hour in a step-down recovery room, where everything was monitored. As I slowly awoke in a recovery room, the nurses constantly checked on the process of coming out of anesthesia, and removed my IV. When I was alert enough to know who and where I was, my wife was escorted in. The surgeon had met with her in a conference room, and reviewed the entire procedure with her, explaining the repair was more extensive than he originally thought, but that he was fully confident of the success – if I followed the post-op procedures and follow-up visit instructions. After about 30 minutes in the recovery room, the nursing staff felt I was ready to dress and go home. The nurse came in and reviewed my discharge papers, asked if there were any questions, and then reminded me of the contact numbers if needed over the weekend. A transport tech came, helped me into the wheelchair, and wheeled me to the entrance, where my wife was waiting to take me home. I was under the affects of the anesthesia for the rest of the day, and also a 72-hour painkiller in the incision. I was given additional painkillers to begin when the anesthesia wore off. Under the care of Dr. Mom, I am following the post-operative instructions with minimal discomfort (thanks to the meds, I’m sure). The entire process, while seemingly routine to the surgeon, and hospital staff, was handled with excellent care at every step. Of course, with my Guest Services passion, I was looking for signs of a process designed with the patient in mind, and this certainly was the case. Dr. Ike Bhasin of Surgical Specialists of Charlotte, and the staff of Huntersville Medical Center provided excellent care, from initial consult to the surgery itself. At Huntersville Medical Center, our goal is providing you with Excellent Care. If you receive anything less, please contact us immediately. Following that statement were two names and contact numbers. This was not just a statement on the wall; it was backed up by the care shown to me every step of the way. The reality was that medical procedures I had were considered routine by the medical profession. The impression I received, though, made me feel anything but routine. I am not just a satisfied customer; I am now a loyal patient of the 3 organizations and staffs I have encountered over the last few weeks – and I am telling friends and family of the courteous, respectful treatment I received. What could your organization learn from my recent patient experiences? Regular readers of this blog know of my borderline fanaticism in the area of Guest Services related to ChurchWorld. Some leaders cringe at those words, but the fact is people who come to church are consumers, and leaders in ChurchWorld can learn a lot from good customer service practices wherever they find them – even in a 1946 training manual for Gulf Dealers. The answer to that question became a little clearer in the last week. My father passed away in 2012, and recent changes in my mother’s health required that she move out of the house in which she and my father had started their family in 1954. Over the last week, as my brother and I were going through the process of moving her from her home of 61 years, I took great delight in looking through some of the items my dad had saved and stored over his life. When I found this manual pictured below, I knew it would become a special part of my Guest Services resources. After my father was discharged from the Army Air Corps following WWII, he worked at several jobs before he and his brother built a Gulf Service Station outside of Nashville TN. My father operated it for 44 years, closing it when he retired in 1993. 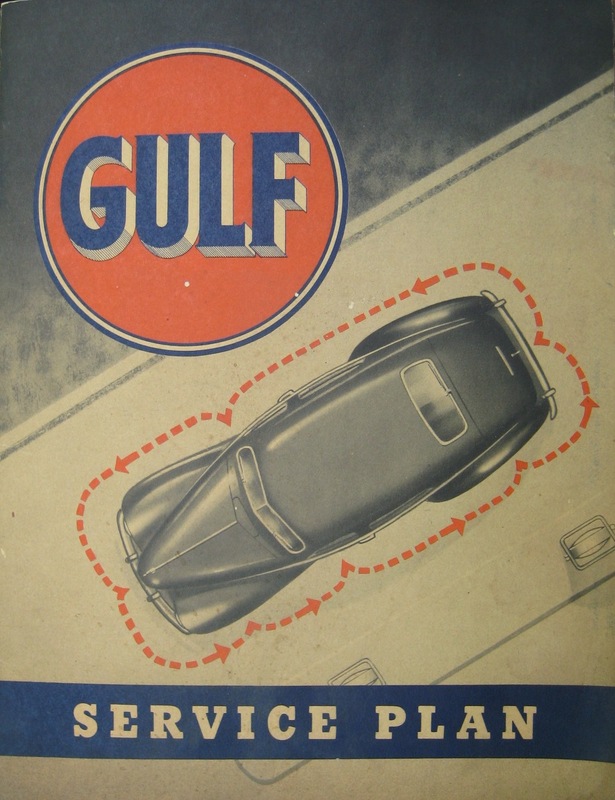 Growing up in that gas station (literally – our house was about 100 feet away) I learned a lot about how to deal with people by watching my father interact with his “customers.” What I didn’t realize until recently was that his natural, easygoing style was augmented by customer service training materials supplied by the Gulf Oil Company. It seems that good service is never out of date. Always be prompt – the service plan starts when you see a customer driving into your station. Whenever possible, be alert and at his side when his car stops, ready to greet him. Greet the customer – your greeting is your first important step in showing courtesy to the customer, and it should be friendly, cheerful, and always in your own words. Acknowledge the other customer – when a second car drives in, you should immediately recognize the other customer and saying you’ll be right with him. This kind of greeting pays off because you not only please the customer who is waiting but you also please the customer you are waiting on, who notices that you are courteous to others. Improve the rear view – while you are at the rear of the vehicle putting gas in, wipe the rear window and tail lights. Should a light be out, call it to the attention to your customer at the proper time. Look at those tires – while you are back there, take a look at both rear tires for cuts, blisters under inflation, etc. and make a mental note to tell your customer before he leaves your station. Work to the front end – walk around the right side, cleaning the right windshield, checking the wiper blades, and inspecting the front tires. Under the hood – check the oil and water levels; it’s your responsibility to protect your customer’s car. If any is needed, ask him if you may bring the levels up to the correct level. Keep alert under the hood – while you have the hood open, keep alert for other service needs. Train yourself to quickly observe all needs, informing the customer as appropriate. Collect for the sale – it is important to give the customer the right change, so count the change back into his hand. If he is using a credit card (yes, they had those in 1946! ), learn to fill out the invoice quickly and accurately. Courtesy is pleasant – before your customer leaves the station thank him and ask him to come in again. By this time you should have learned his name, so make it personal. Help him safely on his way – if your station is on a busy street where it’s difficult to get into traffic, give your customer a hand. Guide him into the moving traffic safely. He may not expect this added courtesy, but he’ll be glad to get it and remember it. Every courteous act will be appreciated by your customers, and make them regular patrons of your station. With the Gulf Service Plan, every time you do some little service for the customer, it makes him realize that you know your business, and that you’re looking after his welfare. These services keep your customer coming back again and again. Good will – the tendency of the motorist to return to a place where he has been well-treated – is being created every time you give him not only what he wants, but what he needs. He remembers you are the man who looks after his best interests by taking good care of one of his most prized possessions – his car. To all of us who live in 24/7, always-connected world, the actions above probably seem like a throwback or an anachronism of the good old days. I happen to think they are a timeless reminder that service still matters – especially in ChurchWorld, where there is no “product” per se, but the outcome of the interactions with our Guests may be eternal. Thanks Dad, for the lessons you taught me even when I didn’t realize it, and for the lessons you still teach me after you’re gone. 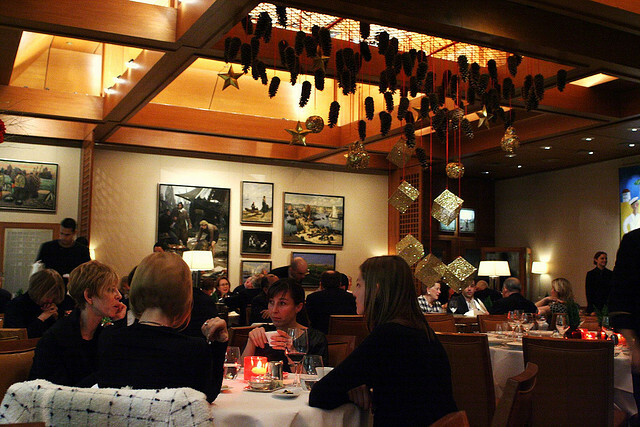 At Le Bernardin, one of New York’s premier four-star restaurants, excellence happens best when it’s not seen at all. A meal there is usually so relaxed and gracious, it’s hard to imagine the military precision with which the dining room is run. Can you say the same about your organization and its interactions with guests? The center of attention in a four-star restaurant may be the food, but it’s the service before, during, and after that creates the experience. At Le Bernardin in New York City, the service is as much the creation of Executive Chef Eric Ripert as is his exquisite dishes. Along with the restaurant’s founder Maguy Le Coze, Ripert has created the elements of service that keep Le Bernardin at the top of its class. • Hiring – while they prefer staff with a two- or three- star background, they have been known to go with their gut instinct and hire the people they like, those that have the demeanor and willingness to please. • Training – the standard of perseverance and constant training is set at the top and carried throughout the organization. General manager David Mancini and Maitre d’ Ben Chekroun want each hire to know what goes into every other job on the floor. The constant cross-training that goes on enables the entire staff from the captains to the busboys to operate in a seamless, fluid manner. • Knowledge – The level of service expected by customers at Le Bernardin is matched and exceeded by the knowledge the staff constantly pursues. From the technical side (knowing the menu by heart, how each serving is prepared, the correct place settings, etc.) to the human aspect (learning to watch guests for clues, anticipating their needs), the staff is always learning. • Attitude – over the years the atmosphere has become less formal, but Le Bernardin’s staff will provide what you are looking for: to celebrate, to eat, to do business, to entertain the family. Their goal is for you to enjoy the experience and leave happy with a smile. • Teamwork – At Le Bernardin, service is like the proverbial chain – a weak link will compromise the whole thing. Anyone on the chain, from the time you make a reservation till the moment you leave, can ruin the experience. It’s all about functioning as a team; even though the service is broken into sections, that’s merely strategic. The entire team is expected to understand the ebb and flow of the service and step in before needed. • Presentation – The hallmark of the food at Le Bernardin is the exquisite simplicity of the food, which calls for adding the final touch at the table. The sauces for the meal are served at the table, which provides several advantages: warmer service, better flavors, and eye-catching presentations. Okay, let’s step away from the elegance of Le Bernardin and visit your church. Is it too big a jump to imagine that your guest services need to have the same elements of service as a four-star restaurant? In each of the areas above, why don’t you brainstorm how you can deliver four-star hospitality to your guests? …at a four-star restaurant provides excellent lessons for hospitality in the church. With one son who is a chef and kitchen manager for a national restaurant chain and another who just finished four years of culinary school and is working as a line cook in one of Charlotte’s top-rated restaurants, I have a serious interest in all things food. My waistline also shows that, but that’s another story. One of my favorite genres of books is that of the food industry, especially those that give a behind-the-scenes look at what goes on in the kitchen and dining room. During a visit to my older son’s house I was perusing his bookshelf and took a look at “On the Line“, about the famous New York restaurant Le Bernardin and Executive Chef Eric Ripert. It’s a well-written and beautifully photographed look at the inner workings of the world-famous restaurant. It’s also full of great lessons for churches that want to have world-class guest services. Your church will not be serving exquisite meals that diners pay big bucks for – but your church can learn that the meal is only a part of the total dining experience. 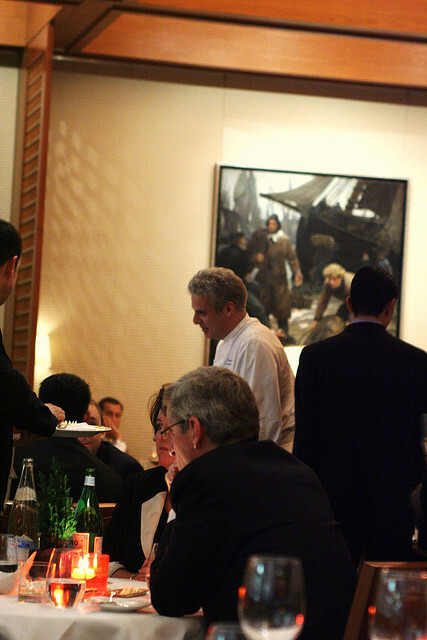 One of the things that diners remark upon after eating at Le Bernardin is that the service is almost invisible. By the end of the meal, you’ve been helped by as many as seven people, but you can’t quite identify them. Although friendly and available, they work out of your field of attention so that you can focus on the food, and companions, in front of you. While it might seem effortless, it’s a rigorous ballet that requires training and focus. The men and women juggle a plethora of details in their heads while projecting an air of gracious calm. In an earlier post, I introduced Le Bernardin’s “The List,” as a way to think about the guest services practices at your church. I hope you’ll join in on the rest of the conversation over the next few days.